This is a very nice quilt. I would love to see it bound and spread out on a bed. I think Marion will be very happy with this quilt. 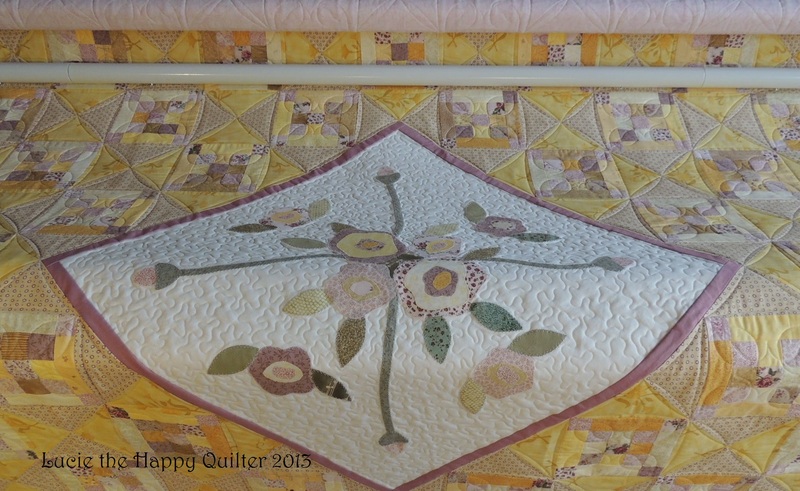 I finished longarm quilting it today. I worked thru the storms. The lights kept dipping but I put my head down and just kept working. The next batch of quilt tops will start arriving tomorrow morning and by early next week the last of them will be here. I can see light at the end of the tunnel. Three weeks today is Boxing Day! I got a lovely little gift on Tuesday from my lovely friend Shelley who is a very crafty person. 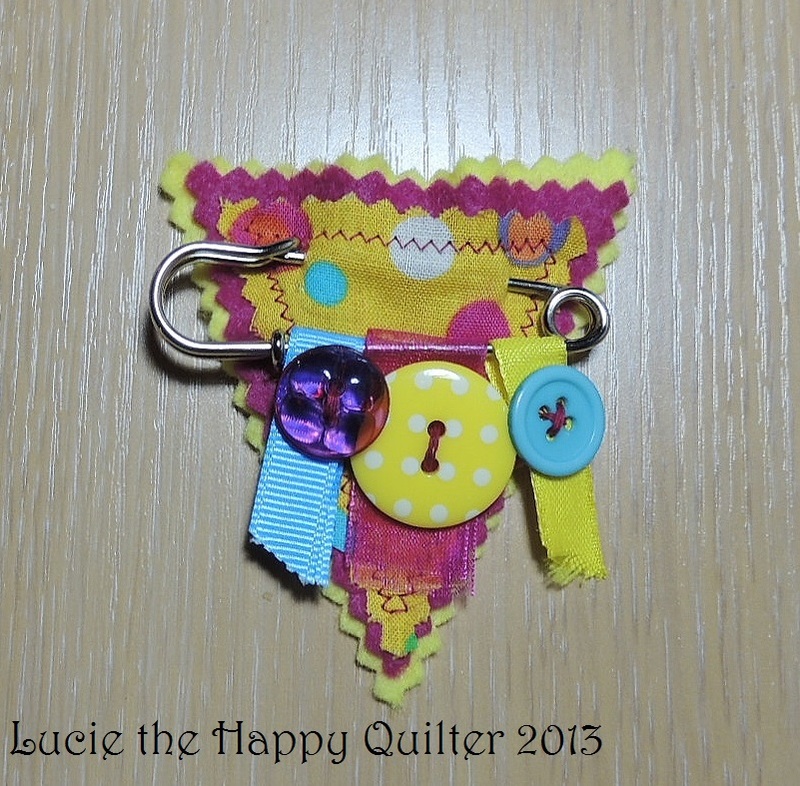 Shelley made this lovely brooch/charm. I love the bright cheery colour and the fact that it’s funky. I plan on using it as a charm on a bag. I guess I had better design a bag using fabrics that tone in with my new funky charm. Isn’t it funny where we get our inspiration? This was a free pattern on the internet which I printed quite some time ago but I can’t figure out where I got it. So if anyone knows please let me know and I will post the link. I plan on turning this stitchery into a useful Christmas gift. 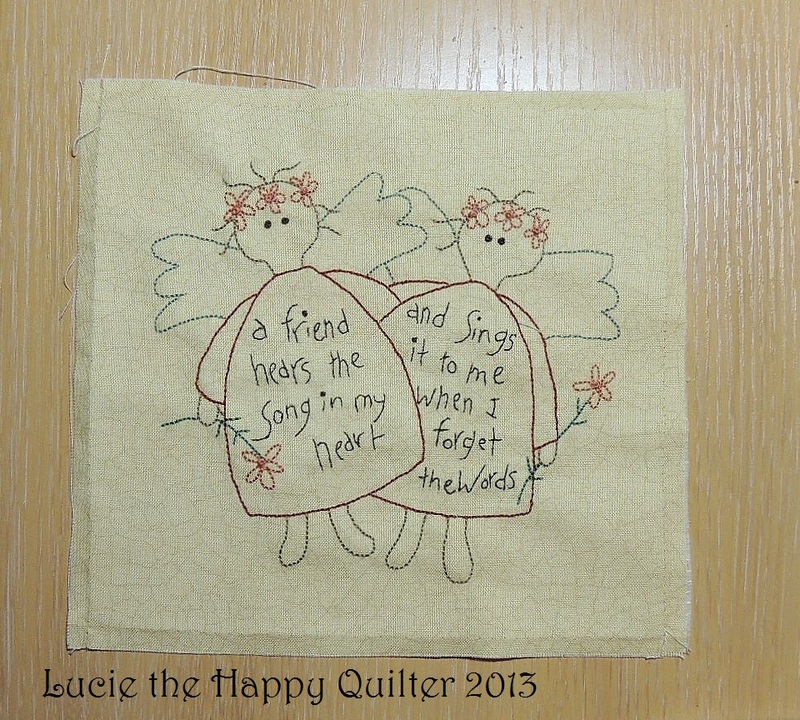 I really enjoyed working on this little stitchery and I love the words. At the moment it doesn’t look like much but I plan on adding some stitchery work which I think will bring the block to life. 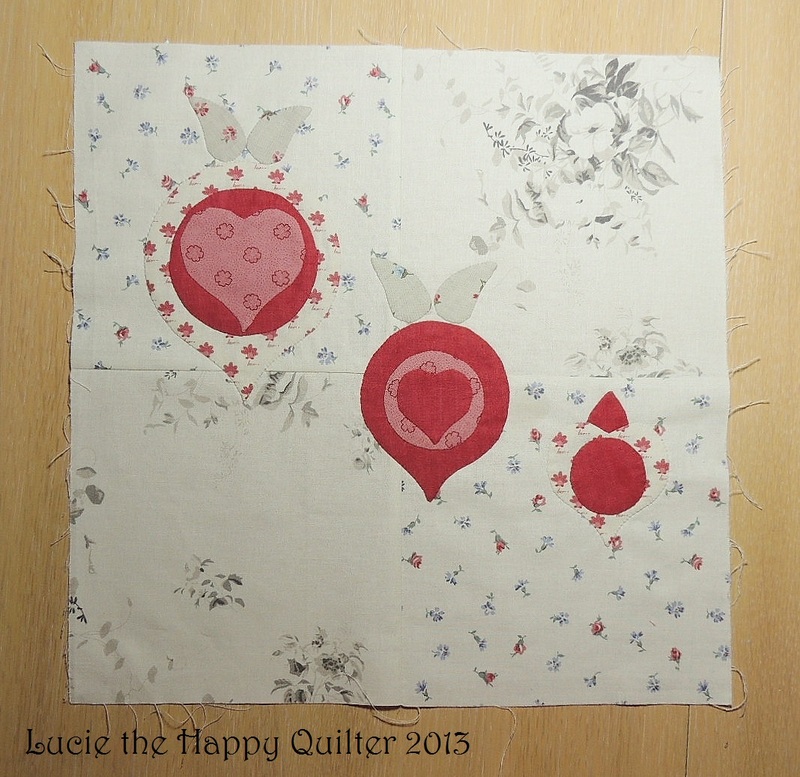 Over the Christmas holidays I plan on stabilising all my “A” is for Applique blocks and doing some stitchery. It’s hard to believe that I’m up-to-date with my blocks. However I haven’t announced the theme for December yet. So let’s get that out of the way so you can all come up with a plan. The theme for December is your Favourite Quote. So basically take your favourite quote and turn it into an applique block. It should be fun to see all the different interpretations of different quotes. Don’t forget it’s never too late to join in. The last theme will be in March. By then we will have 12 blocks to work with. I reckon that’s enough to make a quilt. I can’t wait to get started on my Favourite Quote. Now the weather in my little corner of the England hasn’t been very good today. It was wild and woolly making it feel rather cold. Even my dogs didn’t want to go out for a walk this morning. I’ve been awake since the wee hours because the wind was making so much noise. So after today’s storms I think I’m ready for a bit of snow……. I would love to have a white Christmas. 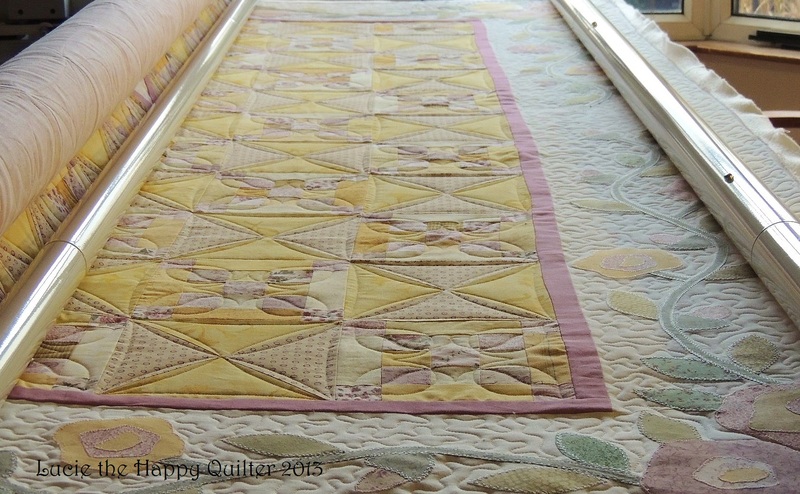 So it’s been a really good day in happy longarm quilter land. I finished Marion’s beautiful Pink Lemonade quilt and started planning what I’m going to work on over the weekend. I don’t think there will be enough hours to get everything done that I would like to do! My lovely friend Karen asked me today if I was planning on getting myself a Poinsettia this year. Well the answer is I haven’t decided yet. My local supermarket has plenty in stock at the moment but I worry that the sooner I bring a plant home the sooner I might kill it. So you’ll just have to wait and see what I decide over the next week or so.